One thing that I love about the modern burlesque scene is that it’s constantly looking for things in popular culture to parody or pay tribute to. I mean, technically, this is what the original definition of burlesque was: “a literary, dramatic or musical work intended to cause laughter by caricaturing the manner or spirit of serious works, or by ludicrous treatment of their subjects.” This week, we have some great events that do just that. We got a tribute to Saturday morning cartoons happening in Seattle, a Wizard of Oz-themed show set to the music of Pink Floyd in New York and a tribute to Joss Whedon in Baltimore. Ironically, what we think of as “classic” burlesque, isn’t as much about parody as it is about sensuality and grace. 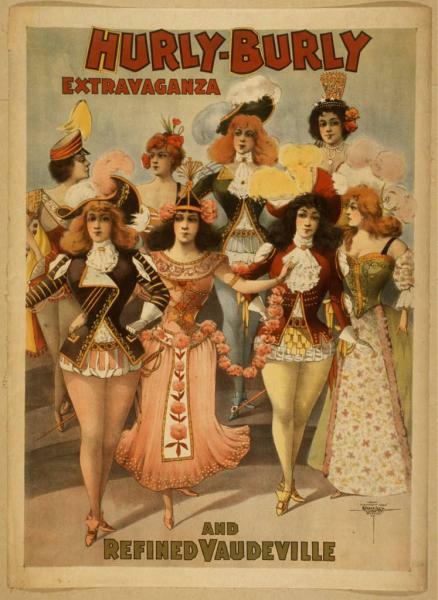 We got tons of shows that feature burlesque of the early to mid 20th century variety as well. There are burlesque classes and festivals happening and even a 6th annversary party for Atlanta’s Syrens of the South! Also, Gotham Burlesque in New York is offering a special discount for this week’s show for our readers. Basically, this week’s Tuesday Tease is just an opportunity for us to brag about the amazing producer that work with us and highlight some of the amazing burlesque events happening this weekend. I guarantee you’ll find something to get you off the couch and out supporting your local burlesque scene. Looks like this is going to be one HOT August! Tags: !BadAss! presents: Dark Side of the Rainbow!, Black Cherry Burlesque, Boston Babydolls, burlesque, Burlesque S'il Vous Plait, Cherie Sweetbottom, Dark Side of the Moon, Evil League of Ecdysiasts, GiGi Holiday Presents: Chocolate Lounge, GiGi Holliday, Gotham Burlesque, Ohio Burlesque Festival, Pink Floyd, Scarlett O'Hairdye, Southern Fried Burlesque Fest, Surly Wench Pub, Syrens of the South, Syrens of the South 6th Anniversary Show, The Sugar Frosted Crunchy Flake Friday Evening Cartoon Hour!, Tuesday Tease, Whedonism II: 2nd Annual Burlesque Tribute to Joss Whedon, Wizard of Oz, Zora Phoenix.